・Baayen, Harald and Rochelle Lieber. 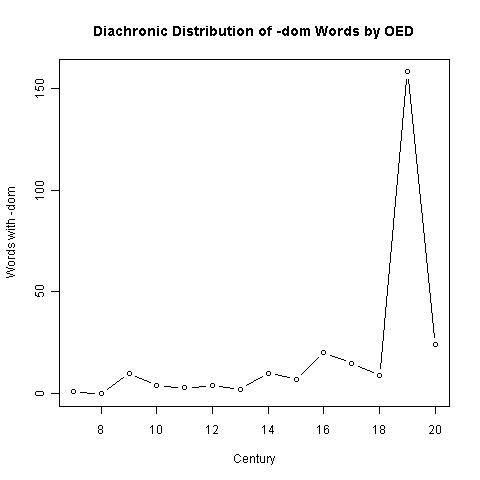 "Productivity and English Derivation: A Corpus-Based Study." Linguistics 29 (1991): 801--43. Of the approximately 300 Modern English words treated in this inquiry, all but a relative few are standard. Many are rich in connotation of empire, of politic organization, of dominion real or fancied. Some are daring, poetic, curious, whimsical. But such traits hardly disqualify the words as standard English, so broad is that concept. A word may have been used scores of times without finding its way into any dictionary,---and a word may be an excellent one even if it has never been used before by any human being. If at its first appearance it is just as intelligible as if it had been in constant use for centuries, why should the first occurrence be more faulty than the three-thousandth? ・ Wentworth, Harold. "The Allegedly Dead Suffix -dom in Modern English." PMLA 56 (1941): 280--306.